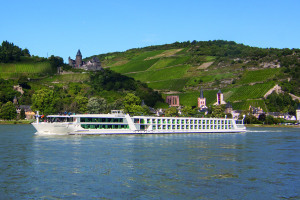 Every Emerald river cruise is full of extras, from a mouth-watering choice of dining options to amazing trips. Return flights from a selection of UK airports with transfers from airport to ship and back are standard, of course, so all you need to do is get to the airport on time! From Europe to South East Asia & beyond, Emerald have put their stamp on luxury river cruising with state-of-the-art Star Ships and well planned itineraries plus the ‘Emerald VALUE’ promise, ensuring an unforgettable holiday that offers great value for money. * New bookings only, not available on Speciality Cruises, Egypt & Jordan, Russia, South East Asia, the Dalmatian Coast or 2020 European River Cruises. Tune in on Friday 19th April at 9pm on Channel 5, when you’ll see Jane McDonald travel down the majestic Douro river valley in Portugal on board the Emerald Radiance and discover a region of picturesque beauty, steeped in history and awe-inspiring grandeur.